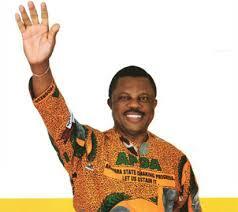 Obiano Wins Anambra Poll By Landslide – Royal Times of Nigeria. Candidate of the All Progressives Grand Alliance (APGA), has been declare winner of the Anambra state governorship election, which held on November 18 as he recorded a landside. It was a sweeping victory for the incumbent governor who won majority votes cast in the 21 local government areas of the state, including Dunukofia and Anaocha local government areas, home of the APC candidate, Tony Nwoye and Oseloka Obaze of the PDP, respectively. Obiano won the election with 234,071 votes, while his closest rival, Tony Nwoye of the APC polled 98, 752 votes, while the PDP candidate, Oseloka Obaze who came distant third with 70,293 votes. The voting figures, as announced by the returning officer and the Vice Chancellor of University of Calabar, Prof Zana Akpagu, showed that out of the 2,064,134 registered voters in the state, 457,311 were accredited for the election, of which 448,771 voted, with 422,314 votes validated and 26,457 votes rejected. Thirty-seven candidates had contested the election.